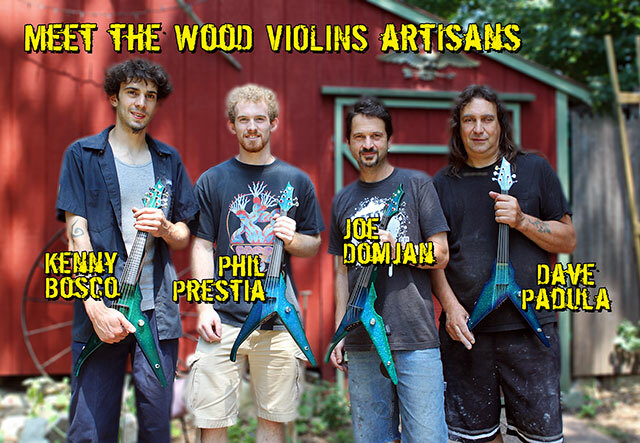 Mark Wood likes to say that the main thing that separates us from the crowd is the fact that, while those ‘other’ electric violins are simply boxes with strings, each and every instrument WE produce is lovingly infused with life by the most incredible team of master craftspeople on the PLANET. … has been Mark’s partner in crime here at Wood Violins for over 20 years. As the shop manager and head luthier, Joe is a true artist in every sense of the word and masterfully designs and builds our Vipers, Stingrays, Sabres, and Cobras. Bringing with him over 30 years experience as a guitar and bass tech, Joe is a guitarist and bass player in his own right. He spent 15 years working in a traditional acoustic violin repair shop, where he mainly focused on school and rental repairs. … is a bassist, an engineer, and of course a Master Luthier. He holds the current title of “shop MacGyver ” (he actually fixed the bandsaw with an old ski!) We consider him to be a true visionary! … is an amazing cellist and is studying engineering at Stony Brook University. He is a robotics expert,a black belt, and our resident evil genius. We tried to get a quote from Phil but he is the strong, silent type. … is a drummer and also the best finisher in the industry. He has painted lots of stuff in his career – bicycles, F l 6 fighter jets, drum sets, and now violins. He is responsible for reintroducing the concept of doing entire custom finishes with only metal flake in the early ’90’s. Dave can match ANY finish request – from Elmo Doll red to rubber toy lizard to treasured cassette player. … is not only an incredible luthier but is ALSO a biochemical engineer, an expert on inlay work, and a pro level baseball player (rumored to have pitched a fast ball at 92mph).